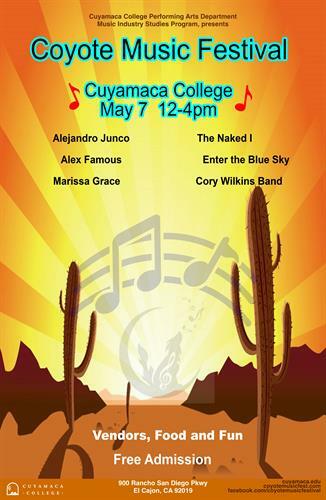 Cuyamaca College is holding their annual Coyote Music Festival at noon on May 7th. Come and experience great MUSIC and fun in an outdoor park-like setting. The Grand Lawn of our beautiful campus will be transformed with TWO stages for SIX different artists and bands from all around San Diego County. There will be a food truck, assorted vendors and plenty of FREE parking. We are proud to feature local talent performing all original music. So, put on your hat and sunglasses, set up your lawn chair and sit back, relax and enjoy an afternoon of great entertainment. And the best part--it's FREE! Call 619-660-4627 for more information or visit www.coyotemusicfest.com or www.facebook.com/CoyoteMusicFestival. May 7, 2016 from noon-4 pm.